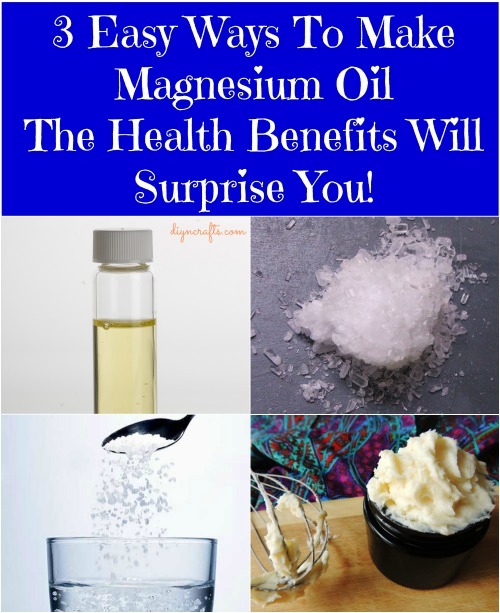 Home » Health » 3 Easy Ways To Make Magnesium Oil – The Health Benefits Will Surprise You! 3 Easy Ways To Make Magnesium Oil – The Health Benefits Will Surprise You! In short, a health problem may make you more likely to suffer from magnesium deficiency, but even if you are a perfectly healthy person in every other respect, you could still be getting insufficient magnesium! Try These Simple Recipes to Make Your Own Magnesium Oil! How Do You Use Magnesium Oil? Magnesium is awesome stuff! It’s essential to a number of different bodily systems and functions. It helps your body tap into the power of adenosine triphosphate (ATP), which gives you the energy to get through your day. It activates nerves and muscles, and assists with the synthesis of brand-new DNA and RNA. It supports digestion and helps your body take in the nutrition you need from proteins, fats, and carbohydrates. It’s also a precursor to key neurotransmitters such as serotonin. There are a number of different forms you can get magnesium in. You can eat magnesium-rich foods, take multivitamin containing magnesium, or even just take a standalone magnesium supplement. There are also topical ways you can apply magnesium. Epsom salts are rich in magnesium and great for a soak—plus a ton of other benefits. And then there’s magnesium oil! The name is deceptive, because it isn’t actually oil at all. It’s actually magnesium chloride which is suspended in water. The texture of the mixture happens to be oily, and thus the misnomer. It does act as a lubricant thanks to the texture, though, so perhaps the name “oil” is still useful since it can be used for similar procedures. Alleviate aches and pains associated with arthritis, joint issues, and inflammation. Reduce the pain of injuries or overworked muscles. Fall asleep faster at night and sleep more soundly. Boost energy levels, both by helping you sleep better and longer at night, and by activating ATP in your body. Relieve headaches, especially migraines and tension headaches. Reduce the symptoms of restless leg syndrome (RLS). Treat eczema and other skin conditions which cause inflammation and pain. Relieve PMS cramps and other discomfort associated with your monthly cycle. Replace your deodorant. Many users of magnesium oil say it works just as effectively, if not even better. Helps to balance your hormones. Improve gum health (by swishing it around in your mouth). Reduce muscle spasms and associated pain. Relax and relieve stress and anxiety. Improve your overall health. Every cell in your body makes use of magnesium, so there are few better ways to give your entire body an instant overall boost. Magnesium absorbs very effectively through the skin, so the oil is a particularly effective way to take advantage of all of the benefits! While you can buy magnesium oil from the store, you can also make it yourself at home to save money. It should be just as effective if you formulate it right and apply it when you need it. All you need for this recipe is half a cup of magnesium chloride flakes, and half a cup of distilled water. You boil the distilled water (it is really important that it is distilled! ), then put the flakes in a glass bowl or measuring cup. Pour the boiling water over the flakes, and stir until the flakes have dissolved into the water. Wait for it to cool, then add it to a spray bottle. You can store and use this mixture for up to six months. What if you don’t use distilled water? The mixture will still work, but the shelf life will be a lot shorter. Distilled water lets you use it longer! If you don’t feel like purchasing magnesium chloride flakes, you can pick up Epsom salts instead. Epsom salts are a lot cheaper, which is one reason you might try this alternative. 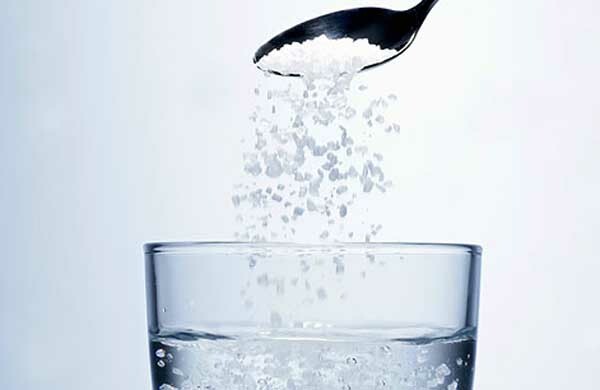 Epsom salts do not have as long-lasting or potent an effect as chloride flakes, but depending on your budget, they may still be the better idea. Plus, maybe you just want a way to take an Epsom salt “bath” without the “bath” part! Making this mixture is very easy. Mix equal parts water and Epsom salt in a pot on the stovetop. Heat up the pot so that the Epsom salts can dissolve into the water. After waiting for the mixture to cool, transfer it into a spray bottle. You can use it the exact same way you use the original basic recipe above with the magnesium chloride flakes. To make this recipe, you will begin by melting the coconut oil and whichever butter you chose over low heat. Pour them into a medium sized bowl after they melt and let them cool for half an hour. When they begin to turn opaque, you are ready to grab a blender and start whipping them. While you are doing this, begin adding the magnesium oil. Do it gradually, and keep whipping everything as you go. Add any essential oils you choose at this juncture. Once you are done, you can put the mixture in your fridge. You can spray on magnesium oil or rub it on; how you apply it is up to you. You should know though before you try it that you can expect a “tingling” sensation. The word “tingling” here is a bit of a euphemism. It’s really more of an outright stinging. For that reason you should check on a small patch of skin before you apply the stuff liberally to make sure that you’re up for it. If this sounds unpleasant, try not to worry about it. Over time, as your body becomes used to the magnesium and your stores finally start building up again, the stinging sensation should lessen. The other good news is that the “tingling” doesn’t really stick around. It may hurt for a few minutes after you apply it, but once it soaks into your skin, the sensation should go away fairly quickly. Steer clear of sensitive areas unless you specifically need to spray on those areas. Areas with fatty tissues like the belly, hips, and thighs are going to be prone to extra stinging. Also steer clear of the neck if you can, as well as creases in your skin. If you have just shaved an area, try to wait around 12 hours before you apply magnesium oil there. That skin is already irritated, and will react unhappily to the addition of a new irritant. If you dry-brush your skin to increase your circulation, again, wait around 12 hours before you use magnesium oil. Your skin is extra-sensitive after dry-brushing. Give your body at least half an hour to absorb magnesium oil before you hop in the bath or the shower. If you notice a white film or powder on your skin after applying the oil, don’t freak out. This is perfectly normal, and it should be easy to wipe it off. Note that you can pour this stuff straight into your bath, just like when adding Epsom salts. This works great for a soothing soak after a hard day’s work. If you have naturally wavy hair, you can spray a little into your tresses to get beachy waves. And don’t forget, you can use magnesium oil as a natural deodorant. Now you know all about the wonders of magnesium oil and why it is all the rage right now! This really is one of the most cost-effective and useful home remedies you are ever going to find. It’s great to relax, de-stress, soothe aching muscles and irritated skin, sleep better, and so much more. Enjoy the easy recipes above, and be sure to share your own DIY magnesium oil recipes, tips and tricks with us in the comments below! Okay I made the one with Epsom salts to try an have used it about a week now and I highly recommend it. My foot swelling is gone but I also feel better that I have in some time including my joint and muscle pain from my autoimmune condition. I guess I had fluid retention all over as I can now see and it’s now gone! I use Nexium and that can lower the magnesium levels I now know. Magnesium oil is supposed to be good for lowing sugar levels so we’ll see next blood test as I have been a little high but not diabetic yet. My blood pressure which never has been a problem has gone down from 113/69 to 102/69. So folks with high blood pressure may want to try this too. Supposed to be good for depression so another bonus. Epsom salt is cheep so why not give it a go? I found it a little drying so I’ll next try the magnesium flakes as it’s a bit better they say and I could always make double strength and add some aloe juice to mine and some essential oils for my hubby’s sensitive nose as he don’t care for the smell to much. how do you use the magnesium oil ? is it for topical use or do you ingest it? I use it as an after bath/shower spray. Spray it all over and rub in until dry. It helps with energy, joint and muscle pain and insomnia. My circulation is greatly improved also. Hi just a hint I have been rubbing Magnesium oil on the surface veins on my ankle and they are getting fainter. thank you . Thanks for that. Going to give it a try. so my question is what if i add organic arrowroot or corn starch will that keep it solid? I use magnesium oil everyday now since a dear friend of mine suggested it. Easy to spray and rub into your skin. My only “complaint” would be that after it has dried, my skin, particularly the legs, have like dry “fish scales” left on them, as if I have extremely dry skin. This means I have to put body lotion on the legs 3-4 times per day to keep the skin smooth. Is this normal? Can I add something to the oil mixture to avoid this? Any feedback would be helpful. Thank you. So then, wouldn’t combining distilled water with the magnesium flakes, actually PREVENT the magnesium from being absorbed into the skin? This is a great article. I never thought about using epson salt to make the mag oil. We live outside the US so need to be careful what is brought in. I have a suggestion about melting coconut oil, if it is hard,. I never melt coconut oil. 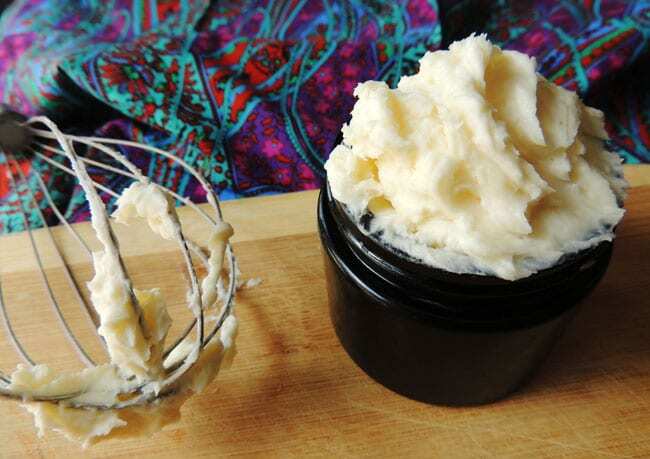 I put it in a bowl along with small chunks of shea butter & my husband whips it till thoroughly blended. This works great. Then I add anything else I want in it. This saves a lot of unnecessary steps. Also, want to include grapeseed oil in the combination I asked about above. What type of oils will be most potent? Is the grapeseed skin oil the same as cooking or essential? ?